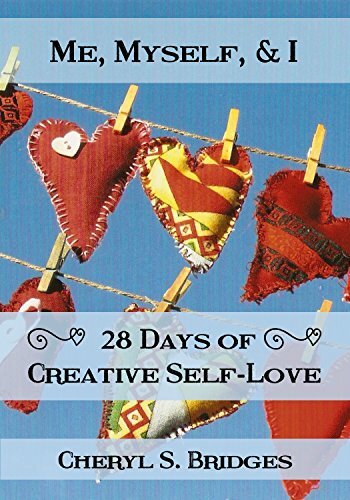 Me, Myself, & I ~ 28 Days of Creative Self-Love is more than just a book! It's a multi-dimensional exploration of how we can learn to love ourselves-warts, wrinkles, and all-with pictures, artwork, and music on every page, as well as creative exercises and journaling reflections to enhance your experience of each day’s topic. More than that, the book offers a repeated invitation for you to open up unconditionally to the beauty of who you really are. It rolls out the red carpet that most of us never got to be okay with that. In this invitation, you can reconnect with your innermost aspects through exercises, music, and color. Connect and communicate with those parts of you that lay hidden. Re-enliven your imagination as the means to both connecting and communicating. Me, Myself, & I ~ 28 Days of Creative Self-Love gives you permission to be and to love all of who you are-from rageful to wonderful-and to forgive all of who you aren’t. It uses language that embraces all of what you bring to life and encourages all of what you have tucked away in the dark recesses of your heart. What a gift! All the musical and artistic resources in the book have been compiled separately for you as a YouTube playlist and here in the Artistic Resources Gallery. Click on the images below as you stop, look, and listen to each day of the book or scan through them as a reminder to love yourself! NOTE: Gallery photos (click on the Cup of Self-Love to get to them) are in order of their appearance in the book. I would be ever so grateful if you shared some self-love with your friends and colleagues. Here some ideas. I'm also open to your ideas! ♥ First off, buy the book! Then, write a review on Amazon! ♥ Buy the book for someone you care about! ♥ Send an email to your community leading them to the book’s website. ♥ Do an interview with me via phone or video, and I’d be happy to share it with my audience, too. ♥ Invite me to be a guest on your blog, your group gathering, or class. I'll create a special self-♥ message just for your audience. ♥ Same goes for your social networks (FB, Twitter, LinkedIn, etc.) - I will provide ♥-inspiring posts for you to share! As an Intuitive Counselor and a Quaker minister, Cheryl Bridges has spent her lifetime exploring the healing power of creativity and the inner spirit. She believes that creativity is the key to discovering and expressing Who We Really Are. Before launching into her quest to find where creativity and self-love meet, Cheryl served as a change consultant and a hospital/Hospice chaplain. In addition to providing intuitive readings to groups and individual clients, Cheryl speaks globally, facilitates workshops, and teaches college classes around the topics of creativity, vocation, and self-understanding. She holds a B.S. in Business & Economics and a Master of Divinity degree. In quieter times, Cheryl enjoys life with her spouse, Tracey, at OakBridge, their lakeside home in North Carolina.